Like many an overachieving tween suckup growing up in the late 1990s, I identified deeply with Hermione Granger. The heroine of J.K. Rowling’s mega-franchise and I had a lot in common. For one, I looked just like her: My buck teeth and frizzy brown hair, once a source of insecurity, quickly came to represent something special as the series exploded into pop culture, first as books and then film adaptations. Hermione’s shameless brilliance, thirst for excellence and ability to solve problems well beyond her grade level — not to mention the validation she got from teachers and, eventually, other students — helped me and plenty of others come to terms with being a little less cool, a little more into books and school, than everyone else. The identification has stuck with me over the years, so much so that in high school, one of my best friends got me a replica of Hermione’s Time-Turner for my birthday. I was beside myself with glee. 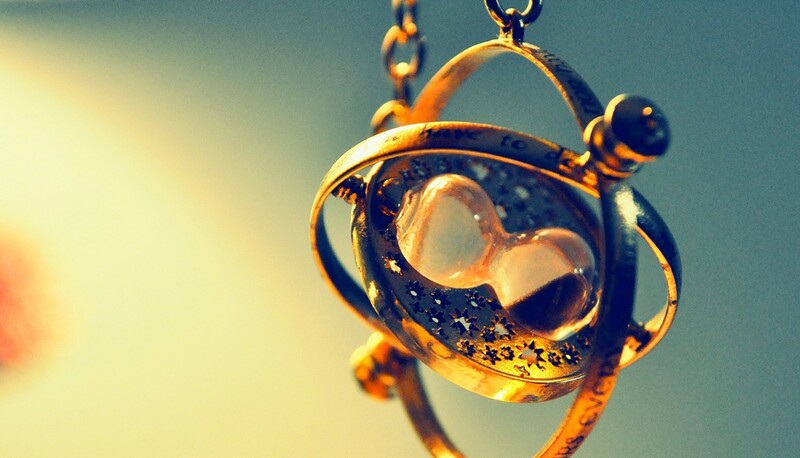 The little necklace, a tiny hourglass embedded in a delicate three-ringed gyroscope, looked exactly like the one in the film adaptation of Harry Potter and the Prisoner of Azkaban, given to Hermione by Professor McGonagall so she can take twice as many classes as her peers. That I now owned one myself, albeit a Muggle replica, was intoxicating; it was beautiful, of course, but just imagine how much more I could do, how many Advanced Placement courses and extracurricular activities I could take up while still having time for a social life and sleep. If only a teacher would entrust a magic-functional one to my care! But I didn’t expect that, in the years since, as my peers and I have grown from obsessive pre-teens into ambitious, overextended adults, the Time-Turner would become part of a cultural ethos, even when it isn’t explicitly mentioned. In college, when we pulled all-nighters with regularity, we’d mainline Red Bull and Adderall to churn out term papers and cram for finals. Now, as adults, we still constantly overbook our social lives, committing to drinks dates and dropping them at the last minute. I bite off more than I can chew at work, accepting more projects than I can reasonably squeeze in, for fear of not making enough as a freelancer, and fall behind on my deadlines as a result. We’re a generation of overachievers epitomized by Hermione’s IRL counterpart, Emma Watson, who transitioned from her successes as a millionaire child star to an Ivy Leaguer juggling a Hollywood career before becoming an ambassador to the U.N. and the occasional face of brands like Burberry. In the original version of the story, Hermione suffers from her double life in the same way we suffered from our all-nighters in the real world. She becomes irritable and impatient, even disrespecting her Divination teacher, Professor Trelawney, after weeks of tea-leaf readings and other “silly” lessons on fortune-telling. Mostly, Time-Turner Hermione walks around like an exhausted zombie, to the point where her typically oblivious friends — all still in the dark about how she’s been managing — start worrying about her. In the movie, though, apart from one Divination blow-up and a much-deserved punching of a racist classmate, she shows no signs of burnout. Her wits are as sharp as ever when she and Harry go back three hours in time to save both their past selves and their friends’ futures. In both the book and film, the professor who gave her the device and the headmaster, Professor Dumbledore, encourage her long-term overburdening without providing any alternative sources of relief. Sure, this might be because Hermione convinced them she could handle it, but Hermione was 13 years old. By the end of the book/movie, at which point it’s implied, not specified, that she voluntarily relinquishes the Time-Turner, readers and audiences are left to believe that the experience has been a net positive for her — it may have nearly killed her, but in the name of good grades and proving herself superhuman, it was worth it. And the drawbacks of a glorified burnout machine are very real. Millennials are, without a doubt, the most stressed generation yet. Twenty- and thirty-something women are burning out left and right; many in the young workforce of Silicon Valley lean heavily on Adderall and other “smart drugs” to better compete with their peers. As millennials, we’ve taken a lot longer to learn our own boundaries than past generations, mostly because past generations had those lines defined for them. I don’t pull energy-drink-fueled all-nighters anymore, and I’m doing my best to work smarter rather than more, but I’ve been wired in the opposite direction for at least half my life, so the transition does and will continue to require substantial effort. Maybe it’s a good thing my Time-Turner broke a few years back. Devon Maloney is a culture writer living in Los Angeles whose work has appeared in Wired, Vanity Fair, Grantland, Vulture, and The Los Angeles Times, among others. She previously wrote about the uselessness of personal finance benchmarks for MEL.